Hours after former Karachi mayor Mustafa Kamal’s grave allegations against Muttahida Qaumi Movement (MQM) chief Altaf Hussain, its leadership rejected the charges, saying that “such moves to divide the party are not new for them”. 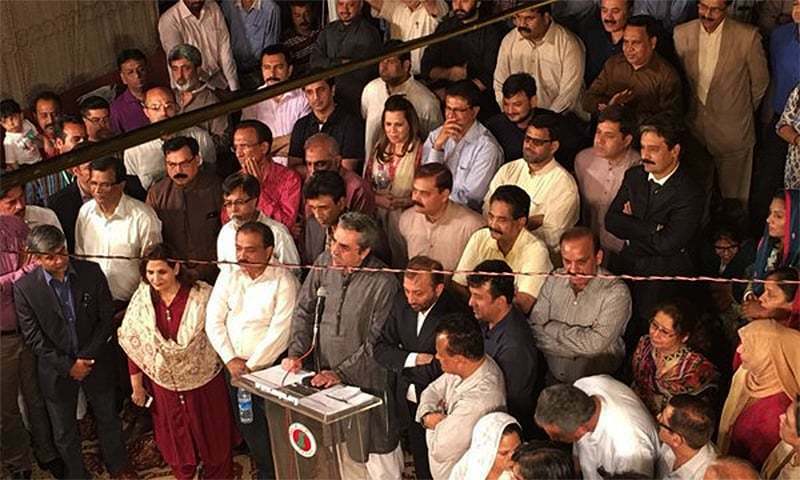 Members of the MQM’s Central Coordination Committee in London and Karachi held a joint press conference Thursday evening after the former mayor lashed out at Hussain, accusing him of links with the Indian spy agency RAW and using his workers to foment terrorism in the port city. “Those who did not have any mandate spoke against Altaf Hussain and elected representatives of the party,” said MQM convener Nadeem Nusrat from London as he responded to Kamal’s tirade against the party head. Nusrat said they did not want to go into the politics of blame-game, adding that the Muttahida had a rich history and “we have emerged successful in election year after year”. He insisted the MQM did not need to clarify anything as people’s court had always issued its verdict in party’s favour. “No one but Altaf Hussain is the solution to our problems and he should be contacted [in case of any issues],” Nusrat said, and exhorted ‘certain elements’ to shun creating the divide and forming new political outfits for such a division. “We should also ask others not to resort to character assassination and personality-bashing, the London convener said, and urged MQM workers not to take law in their hands or harm anyone. Nusrat also observed that while the MQM chief was not allowed to appear on the media, the same media aired baseless allegations against Altaf Hussain. In his address, Farooq Sattar said that ‘timing’ of Mustafa Kamal’s statement was something to ponder on. “Every allegation in today’s press conference has been levelled by Jamaat-e-Islami before,” Sattar said while taking aim at their old political arch-rivals. He said the press talk was only a controversy to once again stir ‘minus-Altaf’ concept but would not succeed at all. Separately, MQM leader Barrister Saif, while talking to a private media outfit, said “a press conference by two people does not affect MQM and its chief Altaf Hussain in any way”. “My party and I stand with Altaf Hussain. The allegations levelled by Kamal do not concern us and have little value,” asserted Saif. MQM lawmaker Syed Ali Raza Abidi also slammed Kamal and Anees Qaimkhani, saying the presser reeked of a “hurt ego” than any “substance”. Earlier in the day, Mustafa Kamal along with former Coordination Committee deputy convener Anis Qaimkhani announced to form his own political party and detailed its manifesto. The two former MQM leaders arrived in the country from Dubai after remaining disappeared for three years, with both announcing to part ways with Altaf Hussain. According to the former mayor, Hussain did not learn from the fact that Pakistan Tehreek-e-Insaf (PTI) grabbed more than 0.8 million votes in the 2013 general elections from MQM strongholds. Instead of opting for a changing in himself, Kamal added, the MQM chief verbally abused PTI’s workers and threatened them. The former mayor also accused Altaf of being behind the terrorism in Karachi and training party workers for the purpose. Once a close confidante to Altaf Hussain, Mustafa Kamal ‘disappeared’ from the country’s political scene and went abroad silently in 2013 citing personal issues.